Get Fighting Fit and Have Fun Doing It! Now you can train amongst boxing’s best when you join Fitness Through Boxing. No prior boxing experience required. We have programs for men, women, and children, including our non-contact, cardio-boxing program for those who just want to get into fighting shape. Fitness Through Boxing works better! A boxing workout is the best of all worlds. Unlike running or cycling, which do little for the upper body, Fitness Through Boxing gives the entire body a workout. And because you exercise many muscle groups at the same time, you’re less likely to strain or injure yourself. Children benefit from Fitness Through Boxing, too! For many children, early childhood is a critical time to form self-esteem and confidence. Through our challenging courses, your child acquires the fundamental skills and beliefs necessary to achieve his or her greatest goals. The benefits of physical fitness include improving coordination, muscle development, and a sense of pride. We can help you get into shape! Our programs are developed for all fitness levels and all ages. We offer private and group lessons for men, women, and children, nutritional counseling, and massage therapy. Stop by and check out our facility, and see how much fun you’ll have at Fitness Through Boxing. Drugs are for losers. Hard work is the only short cut. Our Trainers will help you achieve your goals. See A Video of Top Trainer Rob Vanacore in a recent fight! Fight for your perfect body! Fit bodies work at peak performance. Put that spring in your step at either of Fitness Through Boxing’s locations! Call 631-858-2269 now! 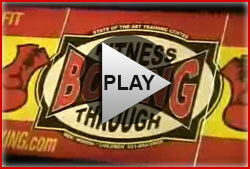 Fitness Through Boxing was established in February 2000. It was the vision of Robert Vanacore. Robert began his journey in boxing at nine-years old. When he wasn’t training himself, he would spend his time at the local Police Athletic League teaching neighborhood youth the art of boxing, helping keeping them off the street. When he hung up the gloves in 1996, Robert took his passion for training men, women, and children to various health clubs and karate studios. he took a shot at his own training center—a small spot on Jericho Turnpike in Huntington Station. With only 1,000 sq. feet and 2 heavy bags, things were rough at first. With a fighting heart, Robert hung in, and with the help of a team of other qualified trainers Fitness Through Boxing grew. In November 2004, the establishment moved to its current location in the Dix Hills Commons. Our second location, in Huntington Station, opened in September of 2006. Today Fitness Through Boxing is the premiere boxing fitness center on Long Island. Call 631-858-2269 for more information on our private and group classes.